Spring hasn't quite sprung yet. But, that doesn't mean you can't begin preparation for the beautiful vegetable garden you've been waiting all winter to create. Late march/early April is a good time to plant peppers. Planting during this time of year will allow the pepper plants to grow and sprout earlier than if you wait until May, when gardening season really starts to take off. So don't shovel away the snow just yet. Instead, find a safe window sill where you can nestle your pots for a few months. It is a good idea to start planning your garden during this final stretch of winter. Think about the location and the plants you wish to grow. When choosing a location, select a spot that is close to a water source to make it easier to maintain. Many vegetable plants require six to eight hours of sun daily. If this is not possible, you can always grow leafy vegetables like lettuce and spinach because they don't require as much sun. Live in an apartment or don't have a huge yard? Not a problem. 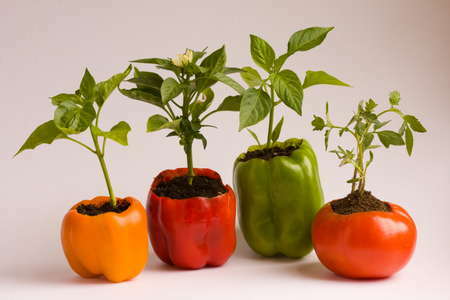 Remember, vegetables require only water, sun and soil. You could utilize the many hanging options to grow plants like tomatoes or simply create an above-ground garden box. This is possible by first layering with newspaper then placing the soil on top. Always purchase or use good soil because success starts in the soil. Wondering how to test your soil? You can simply check your soil's drainage by first soaking it with a hose. Wait one day and then dig up a small handful. Squeeze the soil firmly. If the soil hasn't formed a ball and falls apart, chances are your soil is too sandy. Does it stay together even if you poke it hard? Chances are it is clay. These problems can be solved easily by adding compost, fertilizer or organic matter. Good soil should stay together in a ball but easily break apart; soil that follows these standards has good drainage. Starting a garden is easy. Don't think about it like a huge project you have to complete in one day. Take it one step at a time, and rest assured, by mid-summer, you will be delighting in delectable vegetables. If you're a woman, being described as leggy may be a positive, but if you're a seedling it is anything but. So you have carefully chosen your seeds, delicately planted them and now, the new seedlings are just brimming above the soil in their trays on your windowsill and you can hardly contain your excitement. Perhaps it is the warmer weather that you know is just around the corner, or the excitement of a clean slate after a long winter, but you just can't wait to see the little stems reaching up, and the leaves spreading out and laying small shadows over the soil. When, without warning, the stems have suddenly shot up an inch in three days and the little leaves are bending back over to the soil! You have leggy seedlings. While there may be a long list of reasons that indoor seedlings do not succeed, the most common is when a stem grows too long and thin to support itself, otherwise known as being leggy. In this case the stem will eventually break or will lean over dropping the foliage into the damp soil and causing it to rot or be smothered. So first and foremost, what causes a seedling's sudden growth spurt? Usually it is a lack of light. Just as sunflowers turn to face the sun throughout the day, when seedlings do not receive enough light they will begin to reach towards the available light source, which in turn forces their small stems to stretch and eventually collapse or break. Even a large south-facing window is often not enough light for new seedlings. So what are your options? Purchase florescent lights. These could be regular table lamps or a store bought seed rack with high-density built-in lights. It doesn't matter as long as they are fluorescent and they reach out over your entire seed tray. Make sure they are only 1-3 inches above the plants; close enough that the seedlings won't stretch and far enough that they won't burn your plant's sensitive new leaves. New seedlings need between 12-18 hours of light per day, but heat from the lights can cause increased evaporation, so be careful not to let the seed trays dry out. Install a reflective device. It sounds very high-tech but it could be as low-tech as a mirror or a reflective car sunshade that you wrap around the outside of the trays facing the window. In this case, the plants are receiving the light from the sun as it enters through the window and then receiving the reflected energy from the mirror, or other material, as it throws the light back towards the window. Invest in a small greenhouse. There are plenty of low-cost greenhouses and DIY greenhouse instructions online. Make sure not to move your plants to the greenhouse before the interior temperature of the greenhouse stays above frost temperatures during the nights, especially if your greenhouse has no heat system. The benefit of the greenhouse is that it provides more room for you to house seedlings in an environment where they will receive an ample amount of light (the same as directly sown seedlings). Also, when it comes to soil and water spillage, you can be less careful than you are around your carpets and hardwood floors. 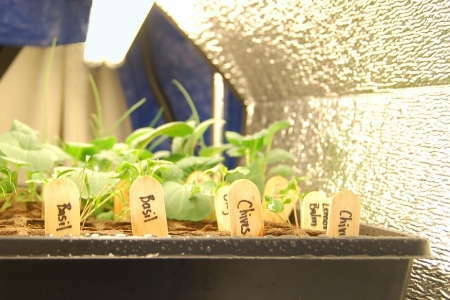 Above you will find some solid ways of providing extra light and protecting your spring seedlings from becoming leggy. But there are other reasons that seedlings become leggy, and one of those is having too many plants in a small space. If you have too many seedlings in a single cell or tray they may begin blocking one another from the light. In this case, their stems will reach up towards the light, and away from their plant brethren, causing, once again, thinly stretched stems. Having too many plants in a general area can also cause them to lean on one another, not requiring them to build strong healthy stems to support themselves. Thin the seedlings out enough that they are not leaning on one another and don't need to compete for light, and soon enough they will be strong and hearty enough to transplant in your garden. Continue reading Coping with Leggy Seedlings. 1. I recently bought a juicer and couldn't stand to trash the left over pulp. Composting is a great way for me to use all of the produce I purchase, whether it's pulp in the juicer or that spinach I forgot about at the bottom of the fridge. 2. A compost pile enriches the soil you use in your garden beds and will save you money on fancy fertilizers. 3. It's recycling. If you don't reuse compostable items, they will probably end up in a landfill. That's sad news for the nutrients in your banana peel and sad news for the plant life that won't be enhanced by those nutrients. These are three very basic reasons why composting is a smart idea, but you can certainly find more extensive discussions about microorganisms, the breakdown of organic matter, and other scientific information regarding how the process works. For me as a beginner, the basics will suffice for now. There is a lot information about compositing on the web, and some of it is intimidating. Personally, at this stage in the game I'm not sure how to check the nitrogen content of my compost ingredients, so I opted for a simpler way of discerning what to put in and what to keep out of my pile. - Greens: This is the stuff from your kitchen and green stuff from your yard. Do not use meat, bones or dairy products. Do use egg shells, tea and coffee grounds, fruit and vegetable scraps, nut shells, grass clippings, etc. - Browns: Sick of all those dead leaves in your yard? Add them to your compost pile! Also add sticks, twigs, cardboard, straw, etc. Note: A side effect of composting could be a cleaner yard. - Moisture: I started my compost pile in an area of my yard that receives extended sun exposure because I decided to do my research after I made my pile. Fortunately for me, the only huge difference this makes is that my pile may dry up much faster than if it were in the shade. Maintaining moisture (do not soak your compost) content in your compost pile is a big deal, so you may find yourself watering your pile every so often. 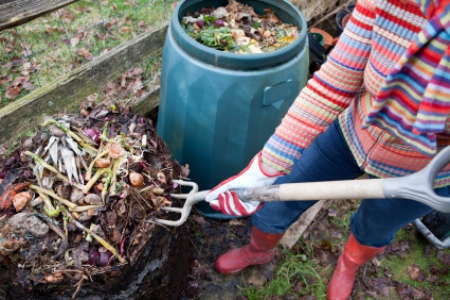 There are plenty of ways to create your compost pile. Some people purchase a compost bin, which can be useful if you are lacking in yard space. I chose to create my compost directly on the ground, though there are many options including concrete or a wooden pallet. Running to your compost pile immediately when you acquire new material can be time consuming and impractical, so keeping a container in your kitchen is a good middle man in the process. Again, there is a range of potential containers. My choice is an air tight plastic bin that I store under my kitchen sink. You might choose to use a small garbage bin, but I recommend selecting something with a lid that will prevent anything from entering or leaving. Lids can deter pests and also block odor. Turning your compost pile aids in the creation of humus, which is what everything you add to your pile eventually becomes. With a shovel, a pitch fork, or any other tool that works for you, you can turn your pile. I've read that some people do this every time they add to their pile, and I've also read that some people never turn their pile. Personally, I give my pile a little turn every time I add to it. So there you have it! These are the basics of getting your compost pile going. One thing I love about composting is that there is so much to learn, so once you get going you can continue to fine tune your process and discover new tricks. Good luck!